So, I’m getting ready for lobster season, and stop by Big 5 to get this season’s lobster report card. If you remember, prior to last season, the report cards lasted the entire calendar year. Last season, if you bought a lobster report card at the beginning of the season, the card would last the entire season. If you already had a report card from that year from the previous season, that card would be valid until the end of the calendar year. If you wanted to continue that season after the first of January, you had to purchase another report card that would expire at the end of the season. Well, I was one of the people that had a lobster report card that I bought in early 2013 and then had to buy one again in January – that one lasted until the end of that season. I filed my lobster report for the year 2013 by January 30, 2014. So, I’m in Big 5 this afternoon and ordered a lobster report card. They asked me for one of my drivers licenses; I gave him the one I use for my fishing license. The total came to $21.60. “Holy, crap, the lobster report cards have really gone up!” I said. The machine printed a small green piece of paper. “I guess so, I wonder why the machine didn’t print the whole card,” The cashier said. Mystified, she called the manager. The manager came over and handed me the paper. “You didn’t file your report for last season, so you just paid the fine,” he said. I hope they never start using that kind of technology when they send out Jury Summonses – which I have never gotten. 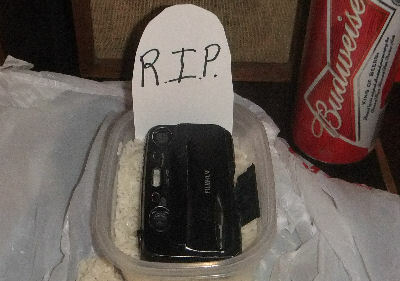 My flooded camera is – deceased. I volunteered last weekend to dive in the Heal The Bay clean up. The diving at the Santa Monica pier was cancelled due to big swells. 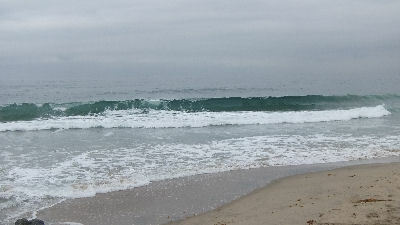 I had volunteered for the Redondo Beach clean up, on the side near the Chart House. We canceled the dive on our end due to conditions, but the clean up under the pier went forward. I don’t have any news on what kind of cool stuff they found – I took off when our diving was cancelled. I’m on a boat tonight for the opening morning of Lobster Season. We’re planning on doing three dives off Catalina and the swell models are promising to make the trip quite the puke-bucket adventure. I like quality posts over quantity, so it may take me until Sunday to complete all the posts from Opening morning. So, fellow lobster hunters, be careful, be safe and good luck! This kinda felt like a “quantity” post. See you tonight. I know this whole bug card fine thing stinks, but I have heard that if we do not turn them in, DFW will insert their own numbers when they figure out population sustainability and this will not be good for us hunting divers. The latest report out shows that the current lobster population is healthy and no major changes are needed, this includes data from hoopers, sportdiving, and commercial. Dammit, just pay the postage and avoid the fine!. Oh yeah, watch the weather out there tonight and be safe.